Montana is not only known for its big skies, but also its big appetites for good food. Among the best cuisine in Montana is Mexican food. Fortunately, there are many authentic choices for fabulous flautas and tasty tacos—which deserve their own list. Luckily, we can help with that. When you’re mining for Mexican food in Montana, these are the restaurants where you’re certain to strike gold. La Parilla—or LaPa, as it’s become known—has been a Bozeman institution for more than 20 years. A casual spot with authentic Mexican flavors, as well as clever palate pleasers in their famous fusion burritos, you won’t be disappointed that you stopped in at LaPa (they now have a location in Helena, as well). Try the Santa Fe burrito. Viva Mexico is a laid-back spot that’s known for fast, friendly service, cold beer, and big servings of authentic Mexican fare at decent prices. Folks come back time and again for the pollo ala crema and the enchiladas. But you know, sometimes a basket of chips with salsa and a cold bottle of El Sol does the trick. A family-run spot, Los Maya’s Mexican Restaurant has been serving up Billings’ favorite Mexican food for more than a decade. They specialize in traditional dishes that evoke the authentic flavors of Central Mexico. The sopa de siete mares—a seafood soup—makes the trip worthwhile, but you should still grab a chile colorado as a matter of principle. Getting our fix! 😍😍😍 #menudo #beans #rice Been wanting this since the weather got cold..
With its Montana spin on Mexican cuisine, Karmadillos Southwestern Café has put smiles on the faces of folks in Helena. Vegetarian and gluten-free options, along with an awesome outdoor patio and good beer selection draw people to this spot in the historic district. Head over on a Friday so you can get a smothered shrimp plate. 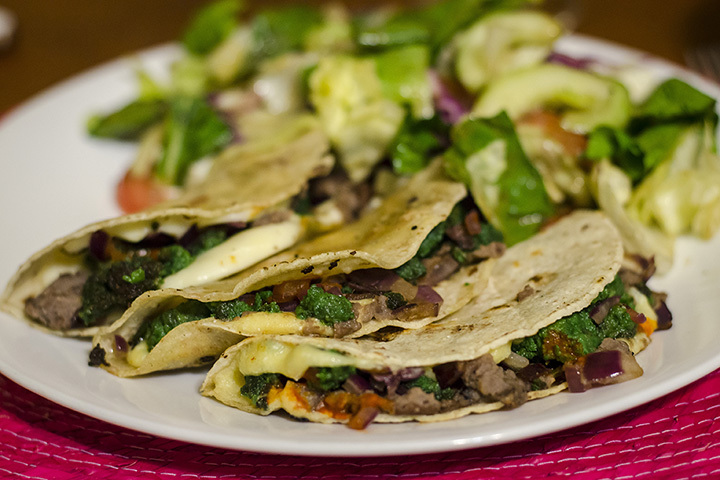 El Rancho Mexican Restaurant is the place to go for comida Mexicana in Kalispell. Although filled with traditional south-of-the-border favorites, their menu also has some dishes with a local twist. The spinach burrito, for example, is not only vegetarian, it’s hearty and delicious. You can find the best-loved Mexican food in Butte at Christina’s Cocina Café. Interestingly attached to an Irish Pub (so there’s a full bar), their Spanish spelling isn’t great but their Mexican food is. Bring your appetite and order a couple tamales. You’ll be full but happy. If you’re looking for a casual spot in Helena with typical Mexican fare, Melaque Mexican Restaurant is the place to go. The portions are big and the dishes are delicious. It’s like comfort food with a lot of flavor. Serrano’s Mexican Restaurant may cater to Glacier National Park visitors, but their reliance on the tourist trade has done nothing to diminish the quality or flavor of their food. They use the freshest ingredients available to craft sizable portions of Mexican, American, and Mexican-American cuisine. Try the huachinago (red snapper) ala Veracruzana. And definitely get a margarita. Beloved in Billings for both burritos and breakfast, Sarah’s Mexican Food is a bright, cozy cafe. Get there early for the chorizo and eggs. If you come in later in the day, get the red chile beef combination plate. The locally-sourced, nouvelle Mexican cuisine at Pescado Blanco Mountain Mexican Kitchen is a pretty as it is tasty. The food is served up alongside a nicely-curated beer and wine list in a cabin-like setting. You’re in Montana: Get the bison enchiladas.